I can supply many details / pictures of the actual item. Plz read captions under pics these help explain the pics in more detail! If you are offering swaps or trades.Plz send a link to model details of model etc of actual item. Link to detailed Photos would be useful too. JEFF GUILFORD at JJ CUSTOM NEEDS NO INTRODUCTION GREAT GUY AND BUILDER!!
. LR Baggs Vintage Passive Stereo Tremolo X Bridge. 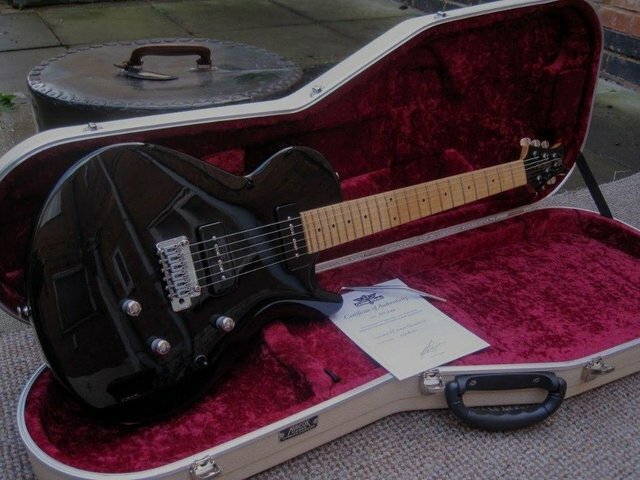 .This Electra is a limited edition custom ordered carved top. .NB.Most photos do not quite show the true body shape!!! !